This conversation on dental health for babies is sponsored by the American Dental Association. This past summer I gave birth to my first child, Nathaniel. As someone who cares greatly about dental health and never misses a cleaning, I found myself researching dental health for newborns before my son was even born. 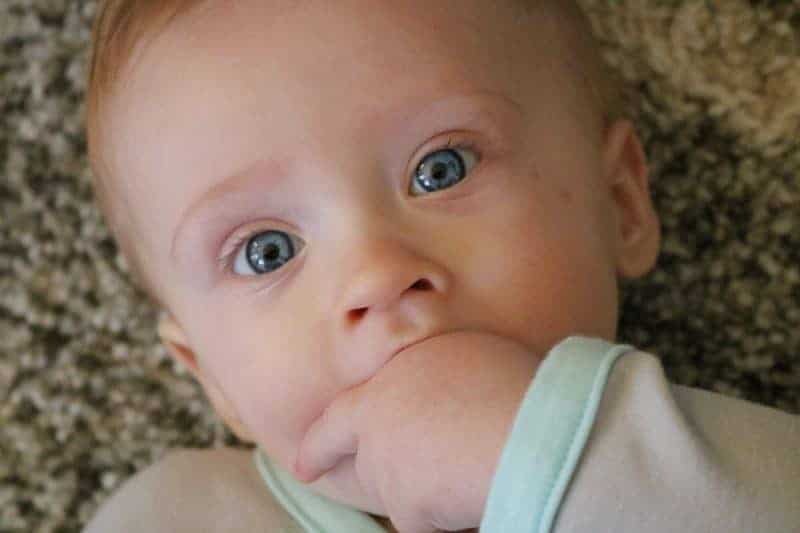 Once Nathaniel hit about 5 months old, he began teething. 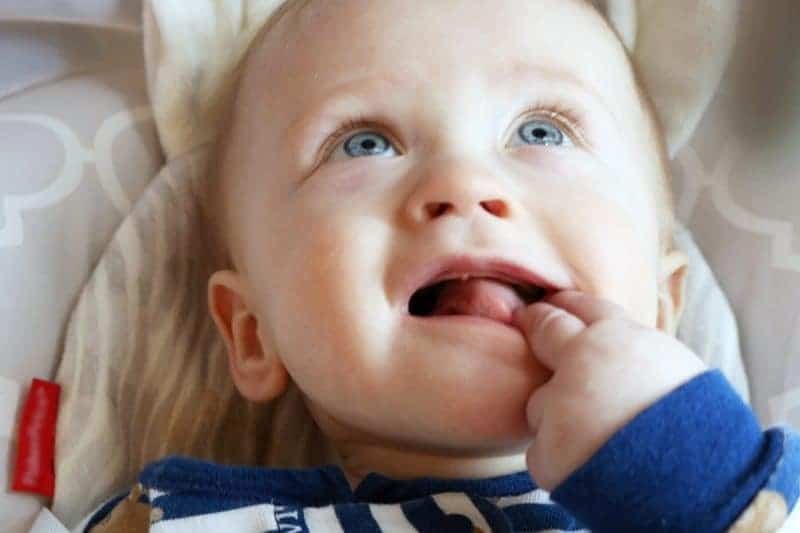 As a dental-health conscious mama, I went on a journey to find all the information I could on whether his irritability and excessive drooling were normal, and how to relieve his teething pain safely. The American Dental Association's website proved to have a wealth of information on all aspects of infant dental health. 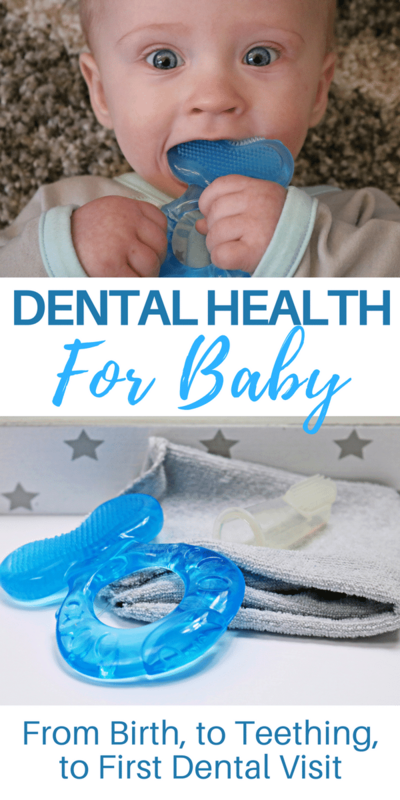 With February being National Children's Dental Health Month, I thought what better time to share a post about dental health for babies than now. That is why I am sharing the information on dental health for babies that I learned with other new and expecting parents, so that they can be best prepared to safely care for their baby’s gums and teeth. It is important to keep baby's gums clean even before their first tooth pops up. 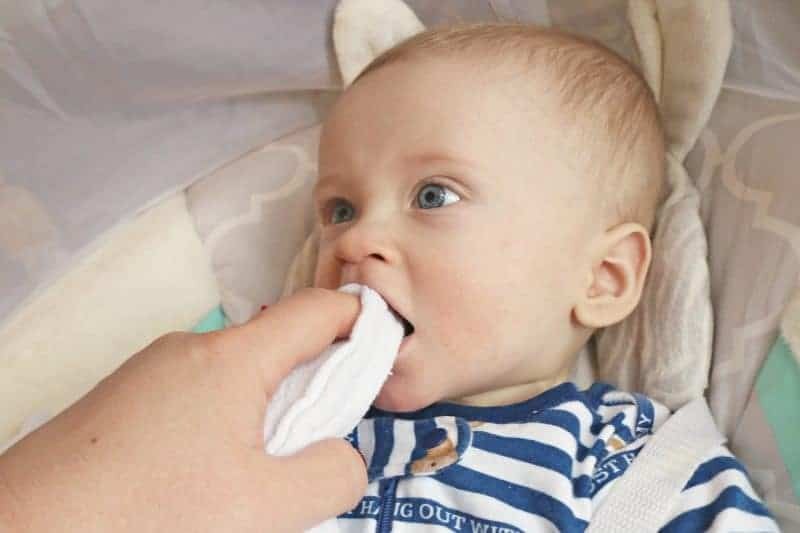 Beginning at birth, parents should wipe their little one's gums daily with a wet washcloth or gauze pad. 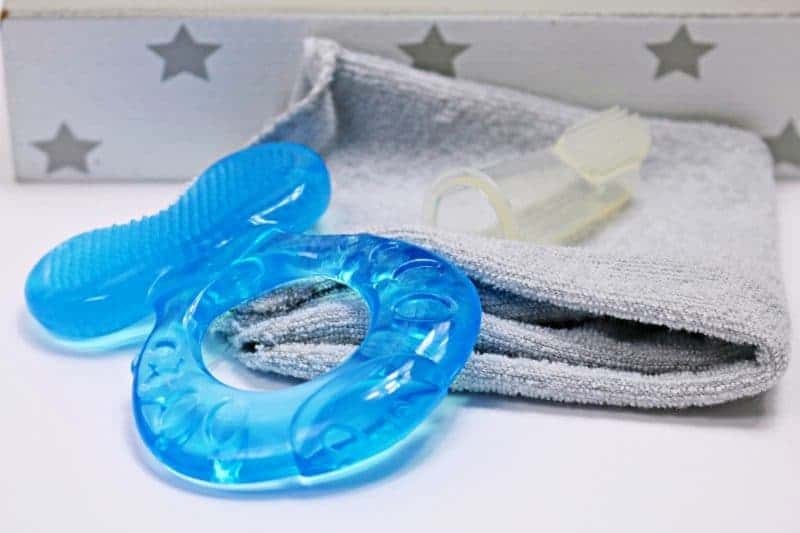 This helps to keep gums clean and free of build-up, as well as get your little guy used to the routine of daily oral care. To be honest, Nathaniel wasn't always a fan of me sticking my finger in his mouth to wipe his gums, but he began tolerating it better as time went on. At this point it is routine, and seems to even enjoy it sometimes. Nathaniel is currently 7 months old and while he has yet to cut his first tooth, he is teething his little heart out. He is irritable and drooling everywhere. 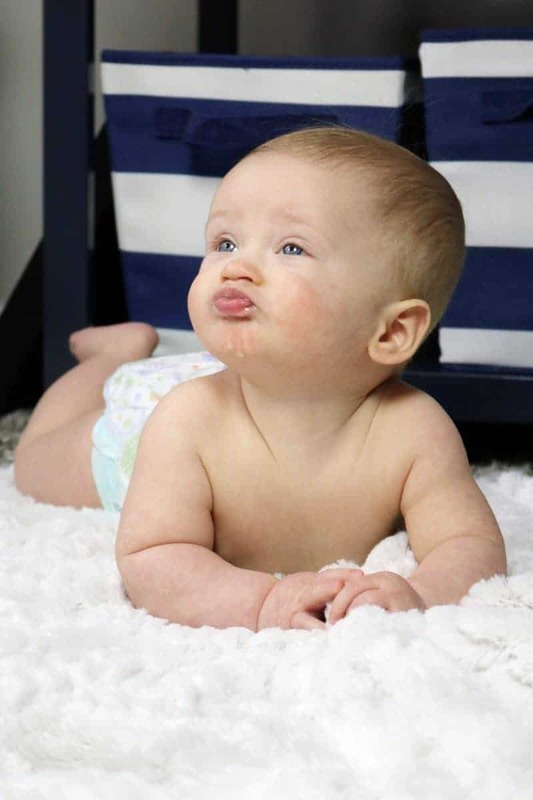 Babies will typically start teething at around 6 months old as their first tooth begins to push through their gums. Contrary to popular belief, symptoms such as fever, rash, and diarrhea are not normal symptoms of teething. If you baby experiences a fever, rash, or diarrhea while teething, you should contact your pediatrician. Teething causes little ones to experience sore and tender gums. Luckily, there are some things that you can do safely to help soothe baby’s sore gums. Gently rubbing baby's gums with a moist gauze pad, cold spoon, or clean finger can help to sooth their sore gums. You can also offer your little one a clean teether to chew on. 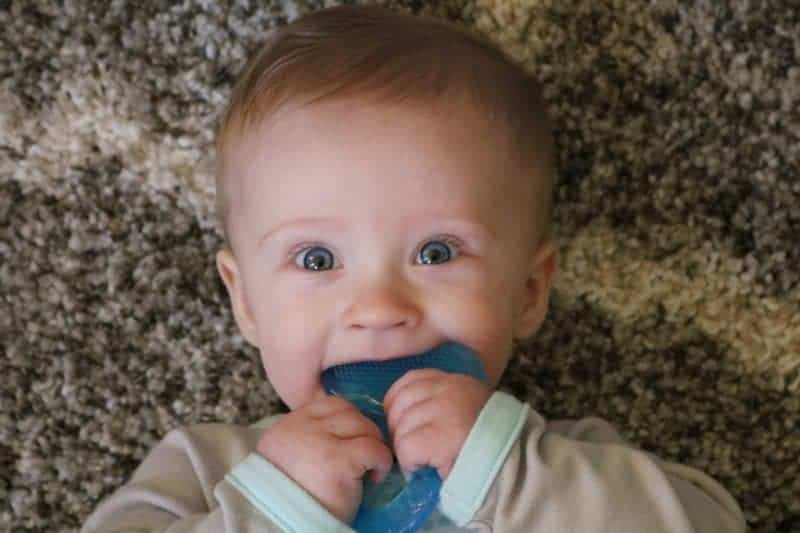 It is important to note that not every product marketed as a teether is truly safe for allowing your baby to chew on. When shopping for a teether be sure to look for one that is made of solid rubber. 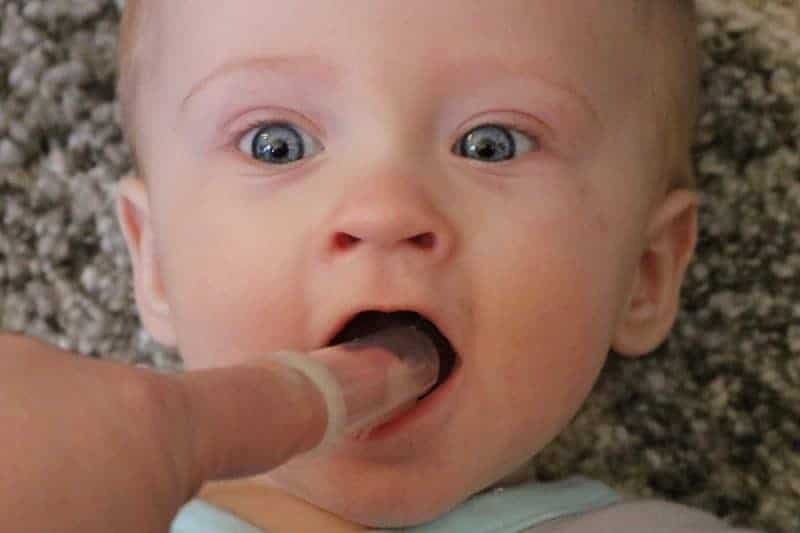 Avoid liquid or gel-filled teethers, or those that are several parts, as these could break and prove to be dangerous. 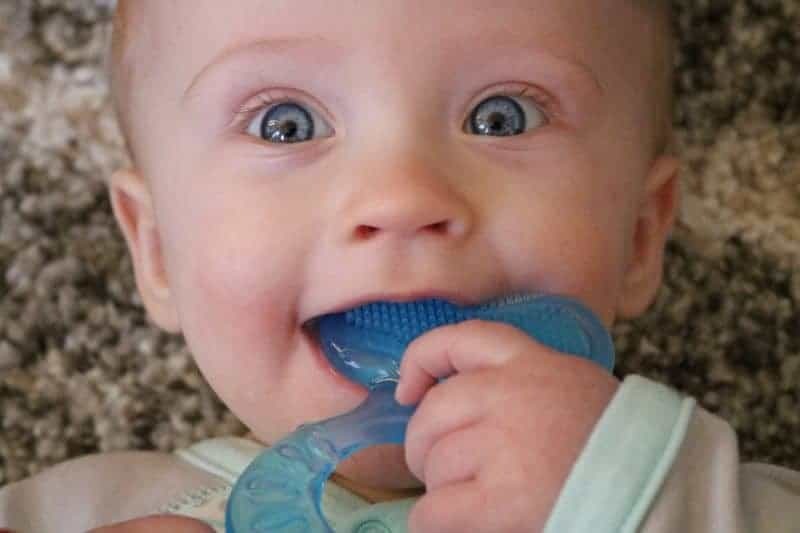 Nathaniel loves his silicone teething ring, and chews on it whenever we offer it to him. It seems to help decrease his irritability and provide him some relief. That said, his fingers seem to work pretty well for him too! While babies are born with all 20 of their baby teeth already in their jaw, they don't typically cut their first tooth until between 6 months and 1 year old. The first teeth to come through are usually the top middle 2 teeth, followed by the 2 teeth on the center of the bottom. By the age of 3 most babies have their entire set of 20 baby teeth. Once babies cut their first tooth it is time to start brushing their tooth/teeth with a fluoride toothpaste twice a day. Look for a toothpaste with the ADA Seal of Acceptance. You can find a full list of ADA-Accepted toothpastes and toothbrushes on the ADA website. As soon as babies have teeth, their teeth can begin developing cavities. That is why parents should schedule their babies first dental visit after their little one's first tooth pop up, and before their first birthday. We plan on calling and scheduling a visit with a pediatric dentist as soon as Nathaniel's first tooth erupts. For more information on dental health for babies be sure to check out the ADA website. Thank you to the American Dental Association for sponsoring this post. I never realized you were supposed to schedule a dentist appointment as soon as the teeth came in. I was always told to have the first appointment around age 2-3. My kids are older though so the information always changes. This is helpful for new Moms to know! We started early with out two and so glad we did. They have had a great history thus far. Just one cavity for each and they are almost in high school. On, I’m so glad I don’t have to deal with teething babies any more, but will be passing on this info to my friends who do. Great info. This is a great post! I remember doing this also with my kids, my own dentist had recommended my kids to seeing a dentist once their teeth starting coming in. Now, my daughter will be doing the same thing with her little one. So many parents think they don’t need to take care of baby teeth since they’ll fall out anyway. Nothing could be further from the truth – they’re all important! Hyy I would love to know which product this is ? 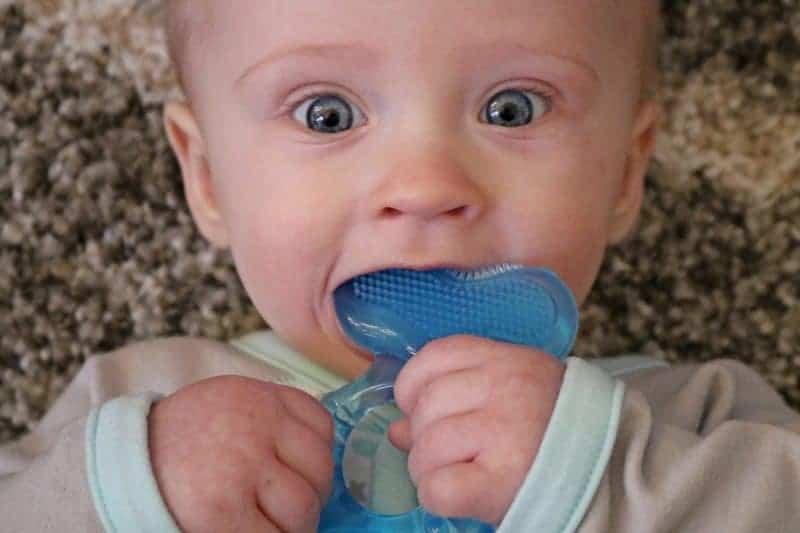 Hi DC – Are you referring to the teether that my little guy is using? Jaclyn Anne….he is a doll!